MR. J. A. WILSON, Canada's Controller of Civil Aviation, in the course of a recent speech to the Young Men's Canadian Club at Montreal, reminded his auditors of a frequently forgotten fact, when he pointed out to them ДальшеMore>>> how much the development of commercial aviation in the Dominion has been facilitated by the immense areas of water which form so large a proportion of the landscape. This feature is so outstanding that whole air services, like that of the Province of Ontario, operate entirely with float seaplanes and flying boats. But Canada has also many fine airports, and even east of Winnipeg there are "dry hops" of sufficient length to make pilots pay a little extra attention to their revolution counters and their oil temperatures while crossing them. These conditions would appear to be a veritable invitation to amphibian aircraft, but it is notable that this type of machine has been almost entirely neglected. But for the Sikorskys, in the heavier class, and one "conversion" job among light aircraft, amphibians have been almost as rare as hen's teeth. Now, in the "Privateer," introduced to Canada by Capt. C. F. M. Chambers, D.S.C., of Insurance Exchange Building, Montreal, we have a genuine and aggressive effort to provide light aeroplane clubs, private owners, and commercial operators of smaller aircraft with an amphibian that has all the advantages of its larger brethren with none of the drawbacks of the revamped float seaplanes which have so far failed to interest the Canadian market. 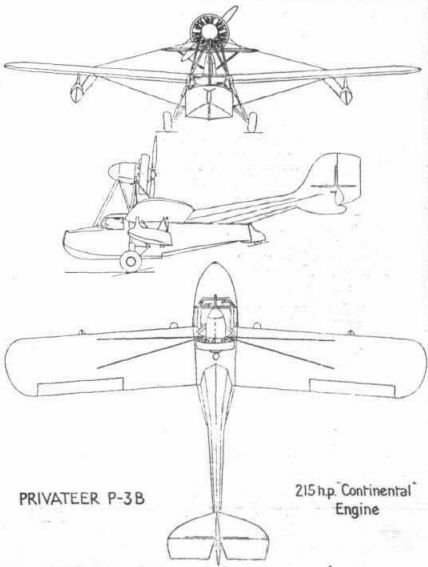 The "Privateer" is distinctly a light aeroplane, and would appear to be an ideal machine for the private owner. Powered with the well-tried Warner "Scarab" engine of 110 h.p., carried on a mounting as accessible as the ingenuity of man could devise, it is easy to service. In the whole structure it would be hard to find a superfluous bolt or an unnecessary curve. And it is the kind of machine one steps into with the same confidence one feels when entering a car. Although not originally stressed for this performance, it has this winter, under the pilotage of Capt. Ted Cooper, D.S.C., on numerous occasions landed on its boat bottom on deep snow. On one occasion at least, when patchy snow held both machines with wheels and machines with skis earthbound, it was manoeuvred off on the combination of boat bottom and wheels. Its makers, "Amphibians, Inc.," of Garden City, Long Island (who are the successors to Ireland Aircraft), are understood to be restressing the hull to see what, if any, alterations are necessary to make this kind of thing part of the regular repertoire of the "Privateer." As the illustrations indicate, the machine is a monoplane, with its air-cooled radial engine set on a simple five-legged strut arrangement. Pause for a moment to take a look at this mounting! The pair of "V" struts on either side carry the weight, and the thrust is transmitted through the diagonal strut which runs right down to the keel. In any crash tending to throw the engine down or forwards, it is the latter strut which collapses. If that happens, the pair of "V's," pivoted to the hull, fall forward, carrying the power plant well forward of the cockpit, and giving the occupants a splendid chance to fly again another day. The hull, a spruce and ash frame, with an "Alclad" duralumin skin, has two steps, and terminates considerably in advance of the tail unit. The entire skin can be put on without panel beating. Wings are composite; spruce spars and stainless steel ribs, fabric covered, as are the tail surfaces. These latter are carried on tubular outriggers, well clear of the water in taxying, and borne high in level flight. The stabiliser is permanently set, but a method of adjustment for nose-heaviness is provided by the lift struts below the tail-plane, which can be rotated from the cockpit, and which, being deeply faired, can make an appreciable difference to the "trim" of the machine. Low-pressure tyres provide all the shock absorption considered necessary, and allow the landing gear to be reduced to the most simple components. One pull of a lever raises the wheels to a position partly within the contour of the wing, and a push on a button allows them to drop back into place and lock there. The steerable tail wheel with a fairing which acts as a rudder gives easy manoeuvrability on land or water. The gross weight of the "Privateer" is 1,950 lb., of which 600 lb. is useful load. The 24 gallons of fuel are carried in the hull, and the 2 gallons of oil in the nose of the engine nacelle. Overall length is 28 ft.; height, 8 ft. 4 in. ; span, 38 ft.; chord, 72 in. ; and the area of the main planes is 198 sq. ft., giving a loading of just about 10 lb. per sq. ft. The cockpit is 48 in. wide, and contains as standard, stick control, life-preserver cushions, fire extinguisher, and the usual instruments. A Heywood injection self-starter for the engine is a standard fitting that exemplifies the bid for private-owner patronage. Tools, anchor and rope, motor cover and first-aid kit are also included. Special equipment at extra price includes brakes, dual control, running lights, and special colour paint finishes. AMPHIBIONS Inc., of Roosevelt Field, Garden City, Long Island, New York, build an interesting little three-seater monoplane amphibian for private owners. The hull is unique in design and construction, the framework being constructed of chrome molybdenum steel tubing, sand blasted, and covered with bakelite varnish, to which is attached wood stringers and fairing strips. A “Vee"-shaped Alclad bottom 0.65 in. thick is bolted to spruce stringers. A process known as “metallising" protects all corrodible metal parts of the aircraft. This process entails sand-blasting all such parts and then spraying molten zinc upon them to a thickness of about ten thousandths of an inch. The covering for the hull consists of 18 oz. duck (of corresponding strength to duralumin) on the sides, and fabric on the top. No metal sheeting is used. All duck is treated with several coats of dope, furnishing a durable moisture-proof finish impervious to water, and which will not leak or crack under the most severe operating conditions. Anchor lines and mooring ropes are carried beneath a deck hatch in the bows. To the rear of this compartment are the battery and tools. Together with these are two compressed-air tanks which operate the retractable landing gear. Aft of the cabin three U.S Navy type flotation bags, any two of which will keep the machine afloat should the hull be flooded, are carried. These are inflated ready for emergency use. Ample room is provided in the cabin for baggage and wireless. The wings are built of routed spruce spars with stainless steel ribs and drag wires. The ailerons are of stainless steel construction throughout and are covered with fabric. Two tanks, holding twenty-eight gallons of fuel each, are carried within the wings. Mounted as a pusher above the wings is a Continental R-670 engine of 215 h.p. The front cowling contains the oil tank and the sides are hinged to permit easy access to the engine and starter. Low drag cowling and a Hamilton steel propeller are fitted as standard equipment. The retraction, lowering and locking operation of the landing gear is effected by moving a small lever similar to the gear lever of a car and requiring no more effort. Mechanically, the automatic operation of the gear is obtained by utilising the stored energy of compressed air derived from a standard Heywood starter which forces air into oil reservoirs. The oil is thereby forced into the retracting chambers and raises or lowers the gear in ten seconds. Bendix brakes are fitted to the wheels, and a pneumatic tail wheel mounted on roller bearings and steered by 1he rudder pedals is combined with a water rudder. Visibility, forward, upward and downward, is excellent. Rear view of the "Privateer" before the start of the flight from St. Hubert to St. Agathe in wintry conditions. The "Privateer" in front of the big Government hangar at St. Hubert Airport, Montreal. Captain Ted Cooper and Captain Chambers, respectively pilot and owner of the machine, are in front of it, and the other begoggled figure is the Hon. Athanase David, Provincial Secretary of Quebec, who was the first official passenger when he chartered the machine to fly him to his home at Ste. Agathe, where the landing was made on deep snow. These three views - on the water, taking off from land, and flying - give a good idea of the unusual features of the "Privateer" amphibian. FROM WET TO DRY: The Privateer amphibian (215 h.p. seven-cylinder Continental R-670 engine) taxying from the water to dry land.